Nokia's non-IFRS figures (a measure of underlying performance) show a higher profit (€303 million) than the standard figures, due to one off charges around restructuring (-€157 million), divestment of businesses (-€151 million), asset amortization, and other factors (total of €418 million). The key Devices & Services division made a small underlying loss of €32 million, down slightly from Q1 2013, but, along with the operating margin (-1.2%), were ahead of expectations and are a significant improvement on the Q2 2012 results. The headline results were roughly in line with analyst expectations and the company's previous outlook. However, sales of smartphones and mobile phones were lower than analysts expected (8.1 million and 56.2 million respectively), questions remain about the Mobile Phone business, and the net cash position fell from €4.5 billion to €4.1 billion. These lowlights are reflected in a 5% decrease in Nokia's share price in today's trading. The substantial year-on-year improvements, increased sales of Lumia devices (up 32%), and strong performance from Nokia Siemens Network (non-IFRS margin of 11.8%) and the HERE (non-IFRS margin of 3.4%) divisions do strike a more positive note. 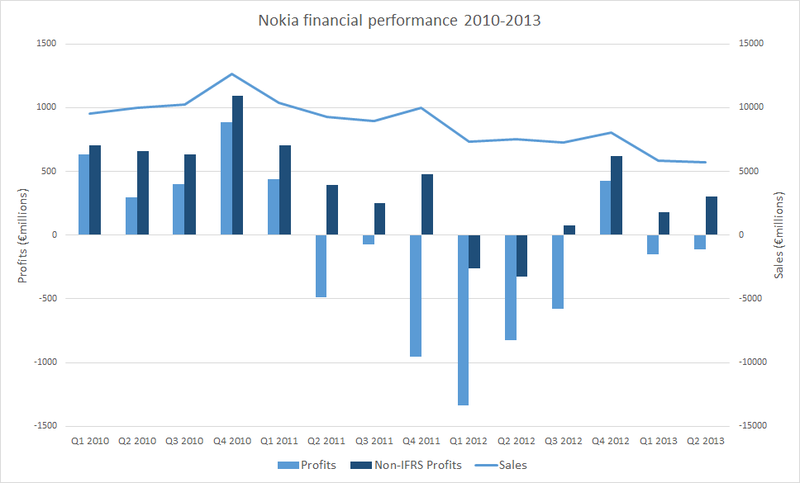 In essence, Nokia's Q2 2013 results are somewhat mixed, with evidence for both positive and negative assessments. In the wider industry context, Nokia's results remain relatively weak, especially when compared to Apple or Samsung. However, compared with other players there are some positive signs. The non-IFRS profit figures have now been positive for four successive quarters and show every sign of being sustained. Nokia should also climb several places in the smartphone manufacturer sales league table this quarter. Notably, if Asha full touch devices are counted as smartphones, it would once again be a top 5 smartphone manufacturer. We're pleased to report an underlying operating profit for the fourth consecutive quarter on a group level. We benefited from another strong performance at Nokia Siemens Networks, which continued to deliver well against its focused strategy. With our recent announcement to purchase Siemens' 50% stake in Nokia Siemens Networks, we believe we will create value for Nokia shareholders and look forward to strengthening Nokia Siemens Networks as a more independent entity. In our Smart Devices business unit, we continue to focus on delivering meaningful differentiation to consumers around the world. We are very proud of the recent creations by our Lumia team, from the Lumia 520 - our most affordable Windows Phone 8 product which has enjoyed a strong start in markets like China, France, India, Thailand, the UK, the US and Vietnam - to the Lumia 1020, our star imaging product which we unveiled to the world last week. Overall, Lumia volumes grew to 7.4 million in the second quarter, the highest for any quarter so far and showing increasing momentum for the ecosystem. During the third quarter, we expect that our new Lumia products will drive a significant part of our Smart Devices revenue. Nokia reported Lumia sales of 7.4 million in Q2 2013, up from 5.6 million in the previous quarter. 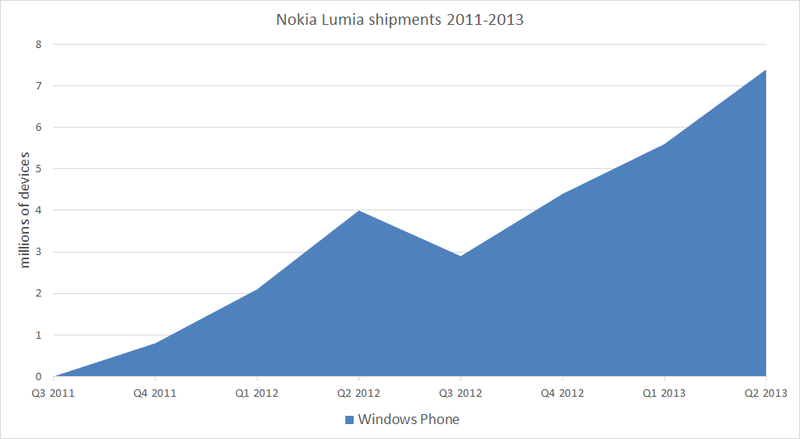 Lumia sales growth was faster in Q2 than in Q1, driven by lower cost devices such as the Lumia 620 and Lumia 520. For the first time, Nokia's Lumia device sales exceeded that of BlackBerry's total device sales, underlining Windows Phone's position as the third ecosystem. Total Windows Phone sales for Q2 2013 should be in the order of 9.25 million, compared with sales of 6.8 million for BlackBerry. For the first time in 10 years, Nokia did not report Symbian sales as a separate figure, indicating that sales were well under the 500,000 of the previous quarter. Symbian devices, of course, remain in active usage, and continue to be supported by Nokia, but it can be seen as the end of an era, at least in sales terms. The average selling price (ASP) for Nokia's Smart Devices was €157 (up 4% from €151 in Q2 2012 and down 18% from €191 in Q1 2013), reflecting an increased proportion of lower cost devices (principally, the Nokia Lumia 620). 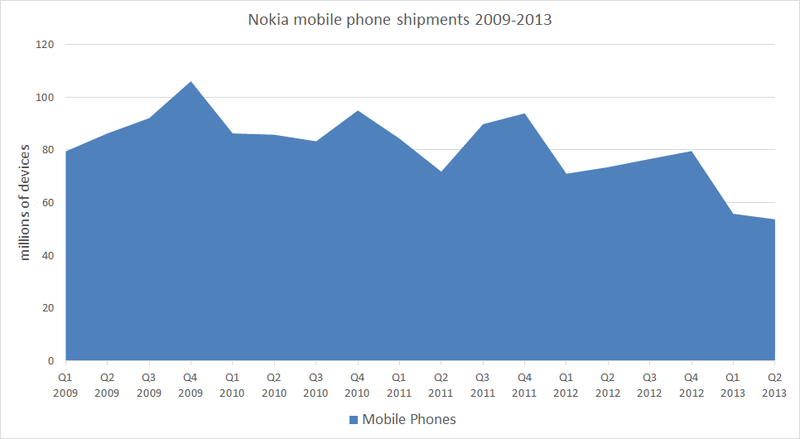 Nokia's Mobile Phone volume was 53.7 million, down 27% from 73.5 million in Q2 2012, and down 4% from 55.8.6 million in Q1 2013. ASP for Mobile Phones was €26, down from €31 in Q2 2012, and down from from €28 in Q1 2013. These figures are poor, continuing the mobile phone trend from the first quarter. However, the decline in sales does seem to have been arrested and Nokia notes that there were "some signs of recovery in the latter part of the quarter", suggesting the second half of the year may be better for Nokia's Mobile Phone business. Despite the relatively poor performance, the Mobile Phone business continue to provide a positive contribution to margin (0.2%) for the Devices & Services division. By contrast, Smart Devices continues to have a negative contribution margin (-14.1%), indicating that Nokia's Smart Devices business continues to lose money (mainly due to higher operating expenses). However, the contribution margin of the smartphone business is substantially improved (up from -32.9% in Q2 2012 and up from -16.2% in Q1 2013), indicative of the positive impact of increased Lumia sales in Q2 2013. In terms of the geographic breakdown of sales, shipment volumes and sales declined, compared to a year ago, in all regions, reflecting the decrease in mobile phone sales year-on-year. Notable was the year on year decrease in China (7.9 million units down to 4.1 million units) and Europe (15.3 million units down to 11.3 million units). There were, however, small quarterly improvements in Middle East & Africa (up 7%), China (up 21%), North America (up 25%) and Latin America (up 9%). 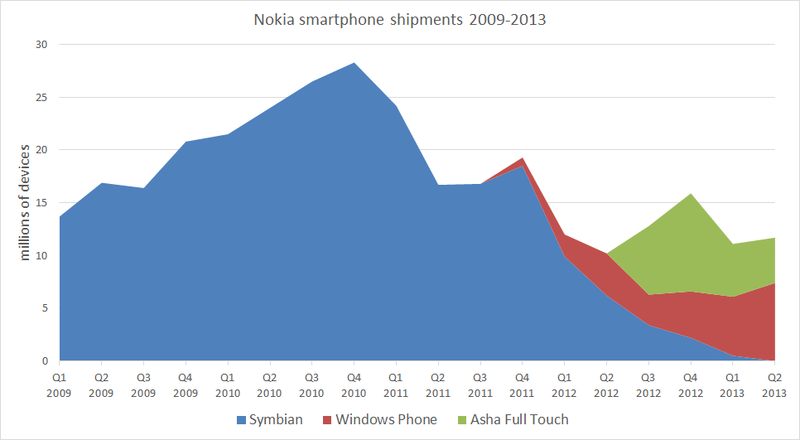 Combining Windows Phone and Asha Full Touch device sales, gives a total smartphone volume of 11.7 million units. This compares with 10.2 million units in Q2 2012 and 11.1 million units in Q1 2013. These "smartphone" sales are obviously down on Nokia's previously dominant position in the smartphone market, but do show signs of recovery. The Asha full touch sales are relatively poor, but may improve with the advent of the Nokia 501. Windows Phone gives a more positive picture, with strong evidence of replacement behaviour, as true smartphone volumes (i.e. 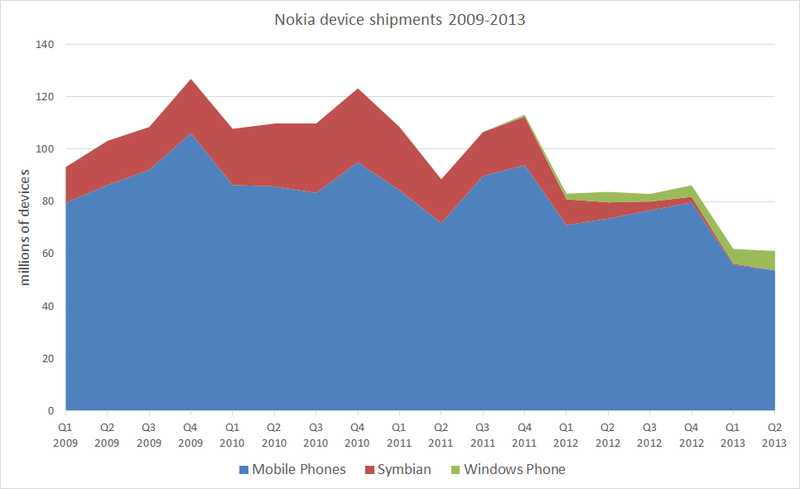 Symbian and Windows Phone) show their first significant quarterly increase since Q4 2011. Looking ahead, Nokia expects to see a similar Devices & Services margin in Q3 2013 to -2% (+/- 4%), reflecting competitive dynamics, changes in device demand, and the macroeconomic environment. Nokia expects sequential growth in Device & Services sales as a result of wider availability of Lumia products and recently announced Mobile Phone products. This would suggest that Nokia expects to see increased sales of Lumia products and stable or increased sales of Mobile Phone products.